So Clarissa woke up this morning perfectly fine and healthy. After clearly being sick last night she was suddenly quite the opposite this morning. Weird, but what a relief. My week can commence as planned. I don't know what the heck happened yesterday but she was happy as a clam today. So today everyone had dentist appointments and tomorrow morning is preschool graduation. We've had our kids at that preschool for nine years (six in a row, then a break and then three more with Clarissa) and tomorrow we say goodbye for the last time. I'm sad about that. I thought I was totally over preschool, but it turns out that I'm sad to say goodbye to it. It feels like a closed chapter and I hate it when things end. I have closure issues. But we have lots of new beginnings coming up and that's fun to look forward to. So many things are changing around me right now. The kids are all saying goodbye to their schools and preparing to move up to new schools next year, my mom and stepdad are packing their house and preparing to leave the country for the next year and a half, Shawn's pharmacy is preparing to move to a new location, Josh gets his braces on next week, and Matthew in the summer...the changes just keep happening. Change is a good thing but I'm finding so much of it at once a little overwhelming. A lot of stuff is coming at me right now and I'm just tying to absorb it all and embrace the change. One new change that I am embracing is the new piano. It turns out that Matthew LOVES the new piano. All three kids have enjoyed playing around on it, but Matthew just can't get enough of it. 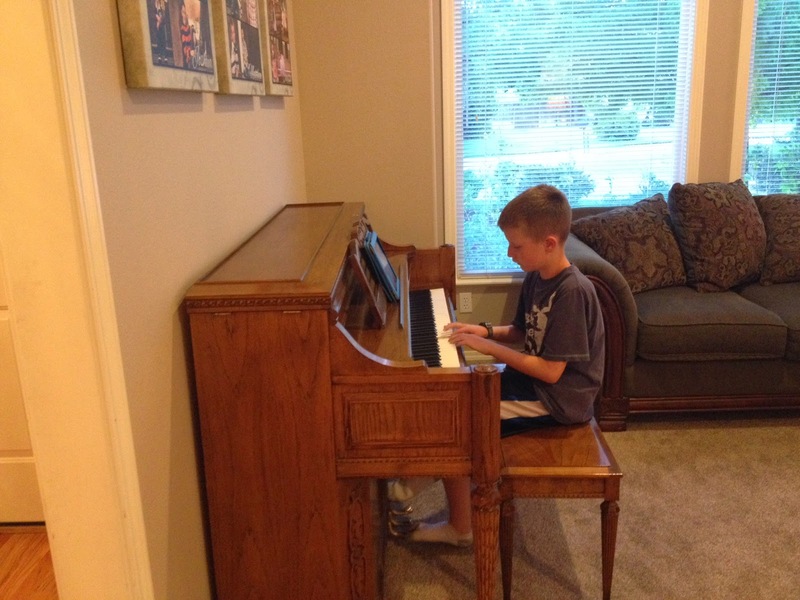 I found him a few piano related iPad apps that have taught him some basic beginner piano skills and he plans his whole days around when he gets to sit down and practice. He races through his homework in the afternoon so he can play the piano. So I decided to go with it and sign him up for piano lessons. It turns out that the teenage boy who lives next door to us teaches lessons to a few neighborhood kids. We've known him for years, they go to our church, and he's a great kid. He's been playing the piano for many years. He graduates high school next week and will only be around for the summer before he leaves home to do missionary work for our church, but he'll be teaching lessons until he leaves. That works out great because it will be enough of an introduction for Matthew to decide if he really likes it and wants to continue. At the end of the summer if the novelty has worn off and he loses interest, that's fine, but if he really likes it I'll find him another teacher after the next door neighbor leaves and we'll keep it going. So Tuesday he starts piano lessons! It's right next door, so it will be really easy for him to just run over there, so it works out great. He's really excited. I have a lead on a teacher for myself as well, but I need to wait until all the end of the school year craziness is over before I can really focus on it. In a couple of weeks I'll be ready to focus on it and get started. I'm really excited! I've been practicing every day with the books that came with the piano. I have a really long way to go before I'll really be playing anything, but it has been fun to play around and start getting used to the piano. We love it so far. So today my happy thing is Matthew playing the piano. He has been playing by ear a little bit and I get a smile on my face every time I hear a recognizable tune coming from the living room. I'm excited for him to start lessons and see where it takes him!